Keeping workers safe by having a member of staff who is fully first aid trained is a legal requirement. Read all about first aid at work, right here. It is a legal requirement for businesses to have someone who is first aid trained on site at all times. Should an accident happen, someone needs to be able to treat any injuries and afflictions to stop the injured person’s condition worsening. Which is why it’s important that businesses either offer or take a member of staff on first aid training courses to ensure that they can treat other staff members in the event of an accident. In this post, we’re going to look at first aid in the workplace. Covering the basics, the levels of first aid required in a workplace and the arrangements too. Find out about first aid in the workplace, right here. As we’ve said, it’s a legal requirement to provide workers with a fully trained member of staff. As per the Management of Health and Safety at Work Regulation 1999, employers but provide risk assessments of the working environment, and assess the need for first aid personnel Following the Health and Safety (First Aid) Regulations 1981, it’s a requirement for employers to also provide equipment and facilities for staff as well. Both of these regulations apply to businesses of all sizes, from huge companies to those who are self-employed and work from home. It’s in place to make sure that all working staff are safe and protected in the workplace. 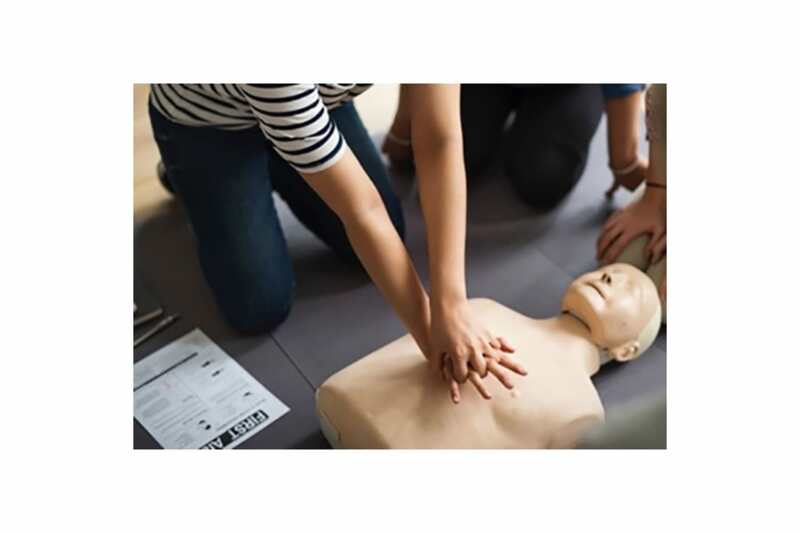 We stress that it is a legal obligation to have relevant first aid in place, and requirements vary from business to business – but we’ll get to that. If you do not have adequate health and safety and first aid in place, you are liable to prosecutions and being sued by both the HSE as well as staff. It’s important for all employers to keep a detailed record of accidents in the workplace, reporting certain cases under RIDDOR (Reporting of Injuries, Diseases and Dangerous Occurrences Regulations 2013). If you’re self-employed, you must ensure that your workplace (even if it’s your home) has suitable first aid equipment to hand. There’re two forms of risk for those that are self-employed. High risk work is for roles which include long-distance driving for example, which require a first aid kit to be on hand at all times. As for low risk roles, home office or desk work, a. standard domestic first aid kit will be suitable. However, you must ensure that you provide this for yourself. Other considerations should be taken dependent on the nature and size of your staff, along with their shift patterns and experience as well. It’s also considering whether employees travel, or if they work remotely or on their own. Proximity to medical facilities and emergency services, as well as assessing the need to provide for site visitors, non-employees and the general public too. Dependent on the size and nature of your business, you’ll need first aid personnel of varying levels. The more staff, the more designated personnel you need. And, the more hazardous your business, the more training will be required for first aid personnel and they will also be required to be onsite at all times. It’s about ensuring that your staff can be treated effectively in the event of an incident that requires first aid. For larger or more hazardous establishments, it’s important that there is a first aid treatment room provided to staff – and supervised by someone who is fully first aid trained. The room must be easily accessible for all members of staff, and open when people are at work. It must be large enough to contain medical examining equipment, such as a medical bed or chair. It must be clean, heated, well-lit and ventilated, as well as supplying drinking water with cups. The room must be tidy and organised at all times, with telephone access and good mobile reception. Ideally, it should be located as close as possible to an access point for emergency services.